by Ronald K. Crandall. Abingdon Press, 2008. 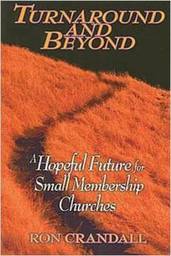 Turnaround and Beyond is a follow-up study to former pastor and author Ronald Crandall’s original research and book Turnaround Strategies for the Small Church. In Turnaround and Beyond, Crandall offers information and insights from both the originally researched congregations and new congregations to reveal behaviors and attitudes that enabled these faith communities to move from maintenance to mission. Crandall’s work is pragmatic and hopeful. Information, scripture, and stories reveal the process, priorities, and characteristics of turnaround churches. He discusses pastoral and congregational leadership and has a lengthy chapter on the challenges that pastors and congregations will face. In the midst of this, he offers reflection questions, solutions, and ideas for addressing the challenges, including during pastoral transitions and into the future. Crandall has a Christian perspective; however, the research and presentation make this a must-read for all who want to change their congregation’s future.